Ex-Pilot of 4 Squadron at RAF Jever - 20May58 to 14Nov60. I guess I was one of the lucky ones who managed to go on and do just what I planned after our apprenticeship. When I had my final interview with Mr Peggs I explained I intended to join the RAF as a pilot, rather than go to Cranfield as he hoped. He became extremely boot and announced that would be a waste of the time spent on me. I tried to explain that I had to work too hard to keep up with the rest of you, especially in maths and I could not carry on like that all my life. I therefore intended to use what I had learned at RAE to try and become a middleman between aircrew and engineers, namely a test pilot. There were snags on the way of course, not least Duncan Sandy's white paper of '57 which resulted in me being sent on a ground tour straight after passing Hunter OCU. That was sorted by nipping into the office of the day fighter poster and sticking my name on a few of his forms while he was out playing sport. The subsequent Hunter tour in Germany saw me married to Pat. Then it was off to Central Flying School to learn how to teach followed by instructing on Jet Provosts at Cranwell. During that tour I got the slot I had been chasing and was sent to do the ETPS course, back at Farnborough in 1963. At ETPS the staff could not decide who had done best, another bloke or me. They chose to give him the trophy and me the top job that we had both wanted. He was a good-looking chap but the day we got our postings he reminded me of one R D Peggs. So off I went to be a test pilot on Aero Flight, no longer in C shed but enjoying a new home at Bedford. The first boffin I met when I walked in there was Ralph Maltby who had been my apprentice master in the 13x9 and spinning tunnels eight years earlier. "I know you" he said, "Take that hat off and let me think". During 64 they sent me to Dunsfold to collect XP831, the first P1127, which they wanted to compare with the SC1. Luck again - being in the right place at the right time. They were interesting times as the engine had a one hour life when running with the nozzles down, after which it had to come out and be stripped down at Bristol. Since that overhaul charge was £60,000 the boffins were looking at an engine cost of £1,000 per minute in the hover, so, if you sat there for 30 seconds and had nothing to say for yourself they got quite excited. That experience set me up to join HSA at Dunsfold in 1967 as a civvy test pilot. By 1971 I noticed Pat preferred another guy. Later his wife, Adele, and I seemed to have things in common so we got married in 1982. Since then we have been struggling to support four adult dependent children, two of hers and two of Pat's. I retired as Harrier Chief Test Pilot when I became 50 and managed the site for the next five years. Then I was sent to Kingston to look at new business opportunities for two years before the bulldozers came in and I was made redundant (ie refused to go to Warton). The last ten years I have been self-employed, helping out with assorted flight test programmes, plus a bit of teaching students various the realities of flight test. The lecturer did his engineering training as an apprentice at the Royal Aircraft Establishment Farnborough before joining the RAF for pilot training in 1955. After flying Hunters with 4 Squadron, based in Germany, he was a flying instructor at the RAF College Cranwell before joining the Empire Test Pilot's School course in 1963. Following a distinguished pass from ETPS he became a test pilot on the RAE Aerodynamics Research Flight at Bedford. During this tour he flew all the UK research aircraft then flying. As RAE project pilot on the P1127 prototype in 1964, he started what was to become 19 years of Harrier programme test flying moving from the RAE to join Dunsfold from where he retired as Chief Test Pilot. As the Harrier programme progressed, he became increasingly involved in overseas ventures especially with the US and various navies, particularly enjoying 1982 when he managed 2 hours gliding in an AV-8B Harrier not noted for its soaring performance. John Farley has flown over 80 different aircraft types, both fixed and rotary wing. In 1990 he became the first western test pilot invited by the Russians to fly the Mig-29 and more recently participated with Lockheed as a JSF Red Team member. He retired from test piloting in 1999 but continues to consult on flight test programmes. 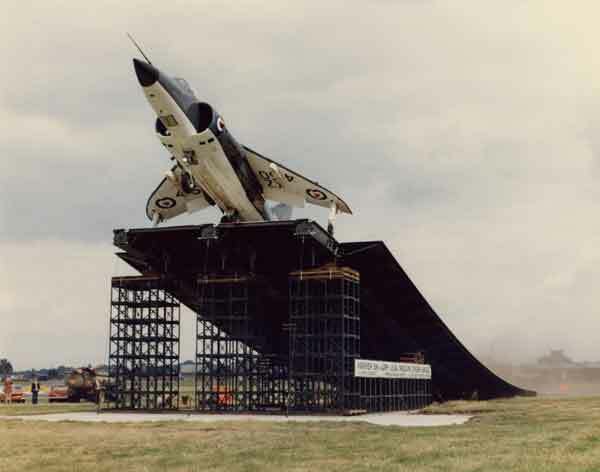 John Farley doing the first Ski Jump take-off in the Sea Harrier at SBAC Show Farnborough 1978. I had an interesting visitor at my lunch table at work yesterday. John Farley had been invited to Farnborough by the site Facilities Manager because old YMCA hostel opposite the Holiday Inn Farnborough, where he lived during his RAE Apprenticeship, is being demolished. John is now 74 but still fit and sprightly. For those of you don't know who the hell I'm talking about, John was the Chief Test Pilot for Hawker Siddeley and was heavily involved in Harrier development flying in the 60's, 70's and 80's. He is not flying these days, but is writing a book of his experiences which he hopes will be published by the end of the year. The last chapter alone is 34,000 words which is like a book on its own; should be a good read. He had some interesting comments about various matters aviation. I didn't know that the 'big wing' Harrier which we call the current GR7/9 series was first mooted in the early 70's when McDonald Douglas were asked by the USMC to double the payload/range of the original Harrier. In fact the RAF could also have had the bigger engine long before it was installed in the GR7 2 years ago, but for some reason the RAF didn't buy it - unlike the USMC (maybe it was money!). Anyway he also mentioned the story of two MacAir pilots sent over to Dunsfold in 1970 to learn to fly the Harrier. After training them for six weeks in Harrier two seater G-VTOL (now in the Weybridge museum) he was not happy to send them solo so they lost patience and went home. Incidentally, the training was a private venture between Hawkers and MacAir not a government deal. After they left he told his masters that he felt they needed more training before being launched in the single seater. A while later one of them was tasked to fly an original USMC Harrier from Cherry Point to St Louis where it was to be modified with the new 'big wing'. He was therefore fireproof when the guy asked to ferry the aircraft had a taxying accident at an intermediate re-fuelling stop with the only other aircraft on the airfield at the time! Brilliant test pilot involved in the development of the Harrier, winning orders around the world JOHN FARLEY, who has died aged 85, was one of the country 's foremost experimental test pilots and was heavily involved in the development of the Harrier vertical and short take-off and landing (V/STOL) ground-attack aircraft. Farley joined Hawker Siddeley at Dunsfold in 1967, as one of the pilots flight-testing the Harrier in preparation for its entry into RAF service. During his service as an RAF test pilot, he had flown the revolutionary "jump jet", the Hawker P1127, the forerunner to the Harrier, and so was familiar with its unique flying characteristics. He was appointed the company's deputy chief test pilot in 1971 and chief test pilot in 1978. 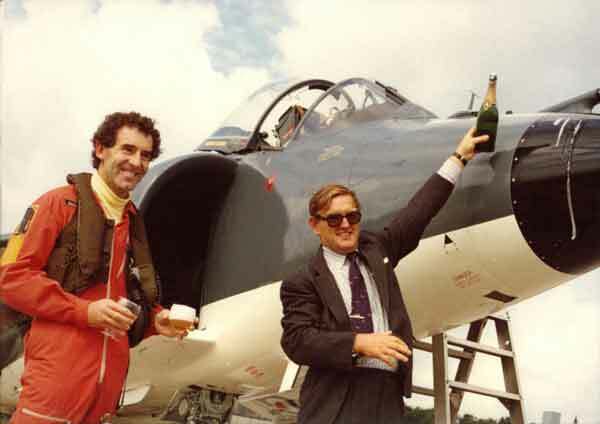 On August 20 1978 he flew the prototype Sea Harrier on its first flight and 10 days later he made the first take-off with the aid of a_"ski jump", similar to those that would be fitted to the Royal Navy's aircraft carriers. A month later, he demonstrated the technique to the public at the Farnborough Air Show. Throughout his 19 years at Hawker's (later part of British Aerospace) Farley concentrated on the development of the Harrier and demonstrated the aircraft's capabilities to national and international audiences. He visited the United States in 1967 and converted the initial group of Marine Corps pilots to the aircraft without the availability of a dual-control version or simulator. This resulted in the first export order for the aircraft. He also demonstrated the Harrier to other potential overseas customers including the Spanish and Indian Navies. Both later purchased the aircraft. 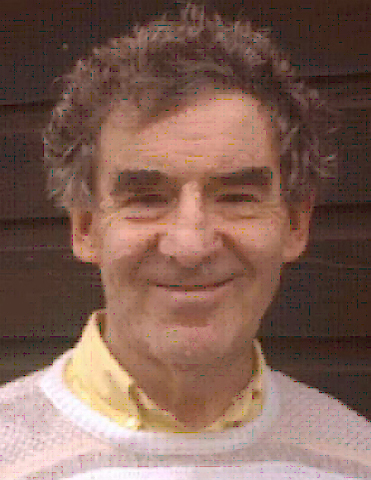 John Frederick Farley was born in Hastings on April 17 1933. 0n leaving King's College, Hastings, in 1950 he joined the Royal Aircraft Establishment at Farnborough as an apprentice, which also gave him the opportunity to fly as a flight test observer. He joined the RAF in 1955 and trained as a pilot. He flew the Hawker Hunter fighter with No 4 Squadron based in Germany before becoming a flying instructor. Always determined to be a test pilot, he was selected to attend the Empire Test Pilots' School, graduating in 1963 with a distinguished pass. He joined the Aero Flight at the Royal Aircraft Establishment, Bedford, where he flew a wide variety of experimental aircraft, including helicopters. In November 1964 he had his first flight in the P1127 before becoming the project pilot for the type, starting an association with the Harrier that would last until 1999. His test flying activities and his contribution to the development of vertical take-off and landing techniques resulted in the award of the AFC. Obliged to retire from test flying with British Aerospace on his 50th birthday in 1983, he became manager of Dunsfold Aerodrome, where he was able to assist smaller companies involved in the development of aviation. Throughout his flying and business career, his motto was always "UK Limited". He left British Aerospace in 1990 to be a freelance test pilot, when he became the first western pilot invited by the Russians to fly the Mikoyan MiG-29 fighter. He also flew the advanced Israeli Lavi fighter prototype. 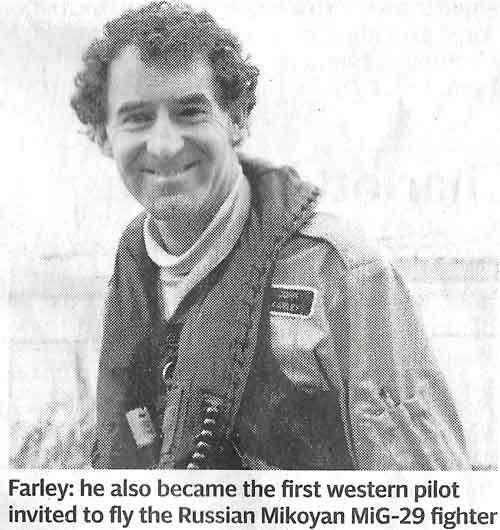 Farley retired from test flying in 1999, having flown more than 80 types of aircraft. He commented: "What a joy it was to be able to do research flying in the days when the aim was to acquire knowledge rather than make money." Highly acclaimed for his aeronautical knowledge, he was in demand as a visiting lecturer and in 1995 started summer school courses for 16 to 18-year-old students to encourage them to become engineers in the aerospace business. He ran the Schools' Aerospace Challenge and the International Aerospace Summer School, both held at Cranfield University. He was elected President of the Association of Aerospace Universities in 2009 and received an honorary doctorate in engineering from Coventry University. For his services to aviation and aeronautical engineering, Farley received a Queen's Commendation for Valuable Service in the Air in 1970 and was appointed OBE in 1980. In addition, numerous professional bodies awarded him their most prestigious medals and awards. These included the Guild of Air Pilots and Navigators, the Royal Aeronautical Society, the Air League and the Institution of Mechanical Engineers. One eminent aviation journalist wrote: "It is, perhaps, quite invidious to compare one test pilot with another, but there can be no possible doubt that John Farley, with his engineering background and analytical, inquiring mind, is one of the finest in the world." Farley was a regular contributor to aviation journals and magazines. His autobiography A View from the Hover - My Life in Aviation was published in 2008 and is widely regarded as a classic. John Farley married Patricia Fox-Russell in 1958. The marriage was later dissolved and in 1981 he married his second wife Adele. Both wives survive him, with two daughters from his first marriage and two stepchildren. John Farley, born April 17 1933, died June 13 2018.